This article discusses how school districts can replace unsafe wired glass and reduce liability by choosing clear, fire and CPSC safety rated glass products that outperform wired glass. options available. Unfortunately, traditional wired glass is not safety glass. In fact, wired glass breaks easily with minimal human impact. In 1977, traditional wired glass was given an exemption from meeting the Consumer Protection Safety Commission’s (CPSC’s) impact safety standard when used in doors, sidelites and other potentially hazardous locations because glass manufacturers claimed that they did not have the technology to make fire-rated glass that could meet the glass safety standards. In the last decade, advances in fire-rated glazing technology led to safer, wire-free alternatives that provide both fire and impact safety. 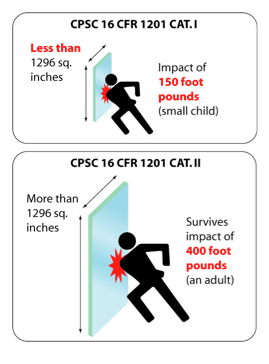 The International Building Code (IBC), which serves as a model for local building codes nationwide, was changed in 2003 to require that all glazing in potentially hazardous locations in educational facilities must comply with the CPSC safety-glass standards. In December 2003, Oregon’s state schools chief Susan Castillo sent out a memo alerting all superintendents that “documented instances of students being injured as a result of collisions with wire glass both here in Oregon and around the country.” According to a recent Multnomah County court case, the Portland school district doesn’t remember receiving this warning memo. The court found the school district to be negligent for a 2007 middle-school accident in which 13 year old Shakiya Sargent’s right leg pierced through the lower pane of wired glass on a fire door separating the cafeteria and the hallway. The jury verdict requires the school district to pay Sargent $222,000 in damages. The Ontario School Boards Insurance Exchange tracks claims from injuries caused by unsafe wired-glass installations. The exchange reports that from 1987 to 2000, there were 107 claims against Ontario schools for glass injuries with costs amounting to $3,154,202. More important than the dollars is the pain and suffering, permanent reduced mobility and scarring caused by these impacts with glass, says the OSBIE website.